Those who favor more government expenditures in the face of a public debt crisis suggest that the very same strategy that has led to the calamity would also be its solution. Yet the debt crisis as such cannot provide any rationale to borrow more. Indeed, the very fact that a debt crisis has shown up reveals that already too much debt has been accumulated. In order to overcome a debt crisis, a stimulus for private business is needed instead of more public spending. The promise that debt which comes with more deficits would get financed by more tax revenue surely has populism on its side and those politicians and academics who proclaim this recipe can be sure to earn applause. Yet these advocates ignore that an emergence of a debt crisis is in itself the evidence that the fiscal multiplier of public expenditure has not worked as promised. The materialization of a debt crisis means that the wonder drug has failed. The case of Greece represents just one of the many cases how governments deal with a debt problem the wrong way. Indeed, most of the European countries afflicted by a debt crisis have taken the wrong approach. In the USA, the current administration has failed to promote free markets in favor of even more interventionism. Japan has been mired in its debt crisis for more than two decades and provides another example that huge public spending programs and zero-bound interest rate policies are of no avail when the statist system is not replaced by radical free-market reforms. When a debt crisis emerges, governments try to ignore the truth which large parts of the population do not want to hear anyway. Politicians learn their job as salesmen of apparent goodies. Consequently, they are inept for elucidating the necessity of less public spending. It runs against the nature of those who live by government that now they should favor less and not more governmental activity and instead of promoting the state, they should now promote the private sector. Even when the public debt crisis represents a national emergency, the usual populism and salesmanship of illusions that is the trade of politics rarely will give way to realism. It is much more likely that the tradition of negligence that has brought about the debt crisis will also dominate politics when the debt crisis has arrived. When will governments learn that there is no alternative to austerity for a country which has reached its debt limit? When will governments recognize that austerity does not need to be painful when spending cuts are made in combination with an improvement of the economic environment of the private sector? When more private production compensates for the reduction of contraction of the public sector, the country’s debt burden will fall because debt becomes less while revenue rises. Even when total debt should not fall right away, lower interest payments will reduce the overall budget deficit and prepare the path for the debt burden to fall. In order to overcome a debt crisis forceful policies in favor of private business are needed. Austerity need not be painful when the contraction of the public sector is accompanied by the expansion of the private sector. This way, the recipe for making austerity work requires to do away with interventionist burdens and to ignite the entrepreneurial spirit. The challenge for the policy makers is not to quarrel about spending cuts but to determine what must be done in order to make the private sector expand while the public sector shrinks. The recovery after World War II in the United States and Western Europe provides the most impressive confirmation of the thesis that spending cuts will stimulate economic activity when they are made in combination with improvements of the investment climate. The reduction of public spending at that time, when the U.S. war machine had to be reduced, happened in an atmosphere which had become favorable again for private business. While regime uncertainty and Roosevelt’s anti-capitalist rhetoric had kept the private economy down in favor of the public sector and of government employment during the Great Depression and in the war years, a new period dawned for free enterprise in the United States and the other countries, such as West Germany, that joined in. Another instructive example for both types of policies is Great Britain. 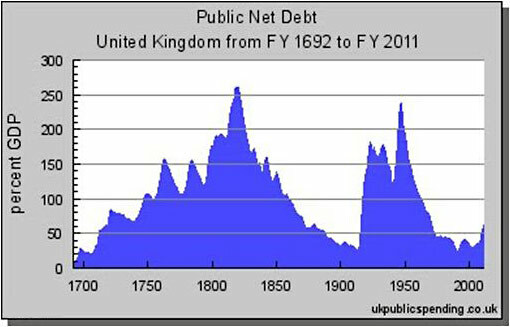 After the end Napoleonic Wars as well as at the end of World War II, British public debt had grown to well over two hundred per cent of its gross domestic product. Yet while in the 19th century, the United Kingdom brought down its debt consistently and experienced its most glorious period of economic prosperity at the same time, the British economy experienced decades of economic stagnation after World War I and World War II. The economic policies couldn’t be more different. While in the 19th century, Britain practiced an economic policy molded after the ideals of classical liberalism and gained wealth and prosperity, the country adopted interventionist policies after World War I and did the same after World War II until the late 1970s. Different from the prosperity that the country earned in the 19th century, Britain earned economic decline and stagnation in the later episodes after the wars of the 20th century. Trying to overcome a debt crisis with more debt is ineffective and a scheme of deceit. It would be just another step closer to final state bankruptcy. The choice between a cut of government expenditure or an increase of public spending runs down to the choice between accepting a period of adversity or to go on with the illusionary joy ride for some time more only to face much larger and longer deprivation later. As to this choice, only a childish attitude would opt for more spending. However, simply reducing public expenditures is not enough. What needs to be done is to combine spending cuts with a convincing policy of promoting free enterprise without any reservation.